Ages 9 and up. Teach idioms and other common expressions using teaching strategies that focus on experiencing, collecting, storing, and retrieving related information. As students participate in the activities, they learn that individual words often have many meanings. The activities in this book challenge students to identify the meaning of expressions and to use expressions in original sentences. Students also compare the meaning of specific "focus words" in expressions that use these words in different ways (e.g., "tune in," "in tune," "tune up"). Selected activities are designed specifically for use with The Expressionary, a comprehensive dictionary of expressions. 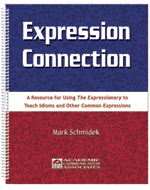 Reproducible worksheets that can be used to teach any expression are among those included in the book.